Loving On Teenagers ~ How About Sponsoring An Older Child? Ah, teenagers. Forget everything negative you’ve ever heard anyone say about them. Teens are some of my very favorite people. I’ve got two amazing teens living in my house right now. Watching God grow them into mature adults has been delightful. Trying at times? Sure. But so were some of the baby, toddler, preschool, early elementary, and pre-teen years. I guarantee that at age 40, I’m trying at times too. Teens are no worse or better than any other human being. They just happen to be going through huge changes in life while they become more independent. Some of those changes are great, and some are very, very difficult. Don’t you remember it? Can’t you look back on your teenage years and remember how difficult some of that was? I remember not knowing how to act as I gave up little girl stuff and became a young woman – relearning who I was. I remember watching others around me and trying to figure out how to avoid doing some of what they were doing, all while trying to still fit in. I remember gaining responsibilities and trying to learn how to juggle them. I remember. I thank God for the people in my life I had to love me through it. Where would I be without them? To all of you who have chosen to join our ministry here at Heavenly Homemakers and sponsor a child – thank you. Can you just picture the joy on your child’s face when they first found out they had a sponsoring family? To all of you who are thinking of sponsoring a child but have not yet jumped in: I challenge you to consider sponsoring a pre-teen or teenager. You certainly can pick a younger child, because oh how they need to be sponsored as well. If that is what will fit your family best – like it did ours at the time we were choosing – go for it! We love that our boys have a “little sister” to love on through prayer and mail. But it could be that God calls you, instead, to sponsor an older child. A child others have overlooked, perhaps. I envision the joy of that child upon finding out that a sponsor has chosen him/her, and I get weepy. Someone wants to help meet their needs. Someone wants to write letters to them. Someone wants to hear what they have to say. Someone from around the world loves them. Think of the mentoring possibilities. I mean, with our little sponsored girl, Gladis, we certainly do all we can to encourage her and share Jesus’ love with her. But she’s only four. We look forward to years and years of growing a relationship with her. But those older kids waiting for sponsorship? I bet you could jump right into an endearing relationship in which you help take the load off of the trying teen challenges they face. Picture this! Let the Spirit lead you. Can you see the beauty of how this might work in your family? If you have a teenager yourself, consider sponsoring one that might become a friend, pen-pal, confidante, and inspiration to yours. The friendship and mentoring possibilities are vast in the case of sponsoring an older child. I pray you consider this. 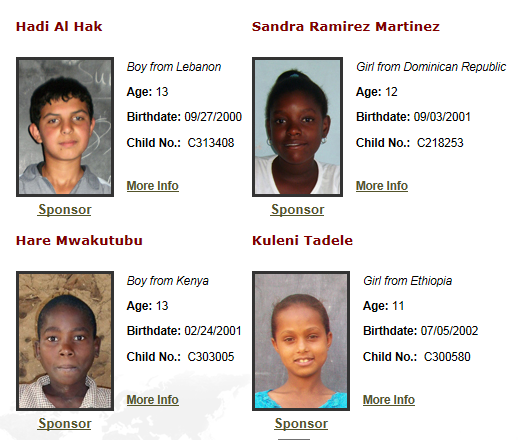 I pray you take on this beautiful opportunity of sponsoring a child in another country. Whoever you choose, whatever the age, whatever the country – know that this choice you are making is a huge blessing, both to you and to the child you sponsor. Please join this ministry!